Korean pop star Kim Hyun Joong is not only loved for his music (as the former lead singer of SS501 and now solo artist) and his roles in popular Korean series Boys Over Flowers and Playful Kiss, but also for his gorgeous looks and that flawless skin you can't help but envy! His secret? The 25-year-old star swears by The Face Shop products, which he has been representing for a year now. Just the day after the very successful launch of his album "Break Down" here in Manila, Kim Hyun Joong faced members of the beauty press at the Palm Grove, Rockwell Club last August 26 for his press conference as The Face Shop brand ambassador. This visit is part of his endorser duties, which includes visiting the 22 countries where The Face Shop has branches. Lucky for his Filipino fans, the Philippines is part of his Asian tour. Naturally, the beauty press wanted to know what his "beauty secret" is, and he said that he simply eats what he wants and gets plenty of sleep. He also uses The Face Shop products, naturally. 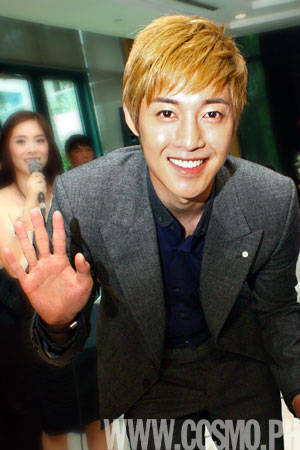 "I can't tell you my favorite Face Shop product because I use a lot," said Kim Hyun Joong through a Korean interpreter. "If ever there's one, it would be E'thym moisturizer." Trivia: E'thym is a play on the phrase "eh-deh-da," which means baby-faced and youthful looking. It's The Face Shop's overseas flagship moisturizing line for summer 2011. Kim Hyun Joong says he also uses The Face Shop BB Cream with SPF--especially the Power Perfection BB Cream--which he finds easy to apply and gives long-lasting, oil-free protection. He recommends this to his Filipina fans, too, especially when they're traveling with their man. He emphasized the importance of using sunblock and moisturizer—even for men—especially in a tropical country like ours. He believes it's time men cared for their skin, too. However, if you'd like to know what makeup look he likes seeing on women, Hyun Joong would say it doesn't really matter to him. "I don't judge [a person] based on looks. I go more for inner beauty. I value personality more over appearance." A heartwarming moment at his The Face Shop presscon happened when Kim Hyun Joong met the highest bidder for the auction of an outfit he wore at an event. The P100,000 proceeds were donated to the women of Abiertas, one of the charities in the Philippines that the Korean star supports. The highest bidder was the daughter of an old lady who proved to be his biggest fan in the Philippines. "I've been to the Philippines before, but this trip is a little more special for me because of the chance to work for our unfortunate sisters," Kim Hyun Joong said when presenting the check to the foundation. "Thank you, and don't forget [to keep] the warmth in your hearts." Launch the gallery to see photos of Kim Hyun Joong at his press conference, read more quotes, and learn more about his favorite The Face Shop products!